Looking "where to sell my Cadillac Convertible?" Ask the Chicago Car Club! Are you wondering "where to sell my Cadillac Convertible ?" The Chicago Car Club is interested in classic cars of all makes and models, especially a Cadillac Convertible. We make the process of selling your Cadillac Convertible quick and painless. In just a matter of hours we will have your classic valued and, if you do so choose, turned into money in your pocket. All it takes is a phone call or electronic inquiry to get the ball rolling. Cadillac is one of the older automobile manufactures in the entire world, and has been specializing in modern, high-end, luxury vehicles as a subdivision of General Motors for the majority of its existence. Cadillac has always been known and well-regarded by classic car collectors for historically pushing the boundaries in terms of design and luxury. One of the most iconic and celebrated luxury models manufactured by Cadillac is the Cadillac Convertible. The original 1953 Eldorado Convertible model was game changing for the automobile industry. The Cadillac Convertible introduced the style and technology of convertible cars into mass production. The original Eldorado Convertible was known as the Biarritz. The Cadillac Biarritz was the name given to the convertible Eldorado model, while the Eldorado Seville referred to the hardtop model. This remained the standard for over ten years, and the Biarritz was the proper name for the Eldorado Convertible until 1964. On the other hand, the Seville name disappeared when Cadillac stopped manufacturing the hardtop version of the Eldorado in 1961. Cadillac went through a large redesign and re-engineering phase in 1961. The Biarritz Convertible was reclassified under the De Ville Series and given a handful of new external and internal features and style changes. Eventually, though, in 1963 the Biarritz took on the Fleetwood style body and became the first ever Fleetwood bodied convertible. The Cadillac Series 75 stopped offering four and two door convertible body styles, so the Biarritz took the fame as the only convertible Fleetwood in production. In 1965, though, the Cadillac Eldorado Convertible officially turned into a Fleetwood sub-series and fully took on the Fleetwood name. 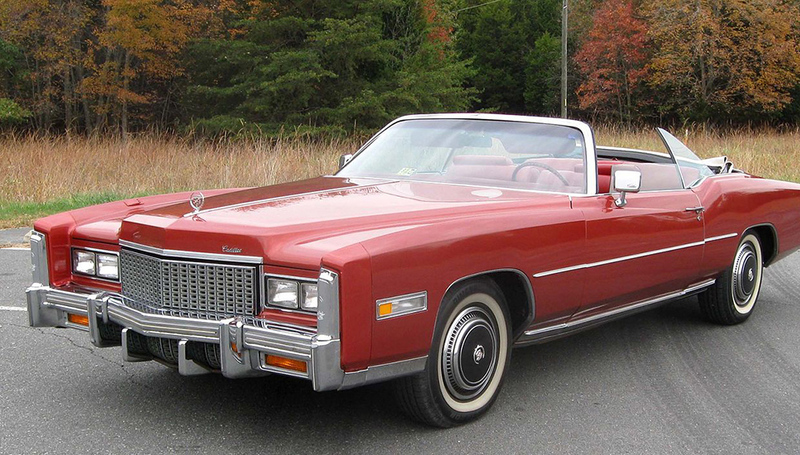 The Cadillac Convertible went to be known as the Eldorado Biarritz to the Fleetwood Eldorado Convertible. With that move the Convertible was also redesigned, but kept the same 129.5-inch wheelbase. The elevated tailfins were taken out and replaced in order to give the car a less rounded look overall. For the next 5 to 10 years the Cadillac Convertible went through significant changes and facelifts. The competition began pushing the boundaries in terms of design and style of convertible cars, and Cadillac has to respond by introducing a variety of new tech and design features to the Convertible every year. The Cadillac Convertible did remain as one of the most popular cars in the United States throughout the 1970’s, though. In 1971, the Cadillac Convertible hit a sales record, and sales continued to grow in the years after. The Cadillac Convertible set the standard for modern, premium personal luxury cars and remained a crown jewel amongst car lovers and in the industry throughout the years up to 1979.